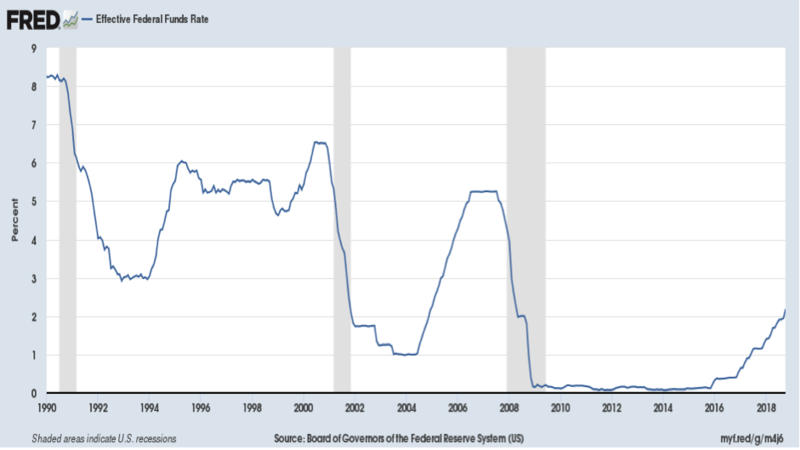 The current Fed rate hikes, combined with efforts to shrink its balance sheet, represent the first sustained tightening in US monetary conditions, and therefore much of the developed world, for at least 30 years. So what does this mean for investors and how should they change their investment strategy to navigate the risks posed by these changing monetary conditions? In December this year, the US Federal Reserve (the Fed) is expected to raise official interest rates for the fourth time in 2018, as it continues its journey to gradually normalise interest rates. This will be the ninth increase since late 2015, and three of four more increases are expected next year. When interest rates rise in the world’s largest economy, this almost invariably has knock-on effects in our globally connected financial markets. It impacts both growth and defensive investments. If we begin by considering bonds, in the very simplest of terms there is an inverse relationship between interest rates and the price of bonds. Because coupon rates are fixed, as interest rates rise, the bond becomes less attractive to investors. To use economic parlance, the opportunity cost of holding the bond has risen. In defensive fixed interest, investors should probably seek to avoid longer-term or long duration bonds. In general, the longer the weighted average maturity of a fixed interest portfolio, the higher is its sensitivity to changes in interest rates. Thus, as rates rise, the longer the duration risk, the larger is the negative impact on the value of the portfolio. So the general approach to defensive investments in a rising interest rate environment is to hold a low duration portfolio, or even a negative duration portfolio (E.g. : Which is possible where the bond portfolio has a derivatives overlay that offsets the bond duration sufficiently to turn it negative). This provides your capital some shielding from higher rates. Investors could also look to add floating rate notes to their portfolio, whereby the interest distributions periodically increase according to some formula as market rates move higher. Alternatively, it could mean that cash plays a bigger role in your defensive strategy. The same is true for defensive growth investments that behave like bond proxies. Property, utilities and infrastructure are the clearest examples because these tend to have fairly predictable cash flows and dividends – much like a bond coupon. All else being equal, as longer-term bond rates rise, the cash flows from property and infrastructure assets face a higher discount rate, making the distributions look less attractive, and this combination can weigh heavily on the capital value of your investment. How do growth assets fare? In growth assets more broadly, a rising rate environment has historically had quite differential impacts. However, in general terms, a higher risk-free rate has a negative impact on valuations by increasing the cost of capital. For a typical company that needs to acquire capital to operate and grow, the cost of equity rises as interest rates increase and the more volatile its share price will be due to perceptions of risk. If a company has gearing, then its expected cost of debt rises and this will also impact financial risk. Another mechanism at play is that higher interest rates also increase investor uncertainty. This is likely to increase market volatility and therefore required rates of return. Hence the premium required for an investor to allocate capital into shares – the so-called equity risk premium – is likely to rise. Overall, then, rising interest rates could be negative for both property and equity markets. And it is also likely that they may be more negative for riskier markets, such as Emerging Markets. It’s also likely that rising interest rates will increase the differences in returns between assets. In less volatile environments, you can count on asset classes (market beta) giving you most of your positive return. In a more volatile environment, asset returns are likely to become more dispersed, so asset selection will become more important. What types of companies might outperform in this environment? At the sector level, banks may use rate hikes as an opportunity to boost interest margins. Sectors that are more defensive – consumer staples, health care providers, paper and packaging – or potentially those that have a well-diversified geographic earnings base, so that they can avoid the impact of higher rates. Consumer discretionary stocks often struggle in a rising rate environment as disposable income is crimped via higher borrowing costs. It’s a similar story in building materials. Overall, this change in the global monetary policy stance may sound somewhat esoteric, but the implications for asset prices could be profound and long-lasting. Bonds, property and equity markets will all be affected, so investors should carefully consider how their portfolios are structured. We’d suggest an overall movement to low duration assets, floating rates and more active management are essential considerations for any portfolio.